October is packed with events for a variety of interests, including concerts that run the gamut of music genres, exhibitions, readings, and even a hike up nearby Panola Mountain. 1. Syncopate your rhythm with three jazz concerts. Jazz on the Green returns for the more moderated heat and humidity of fall with two Thursday performances, Oct. 4 and Oct. 18, both at 6 p.m. on Patterson Green. That outdoor space invites chairs, blankets for sitting, picnics, friends and family. 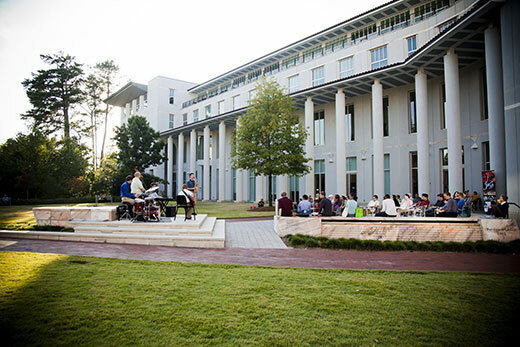 Go indoors and bring the kids on Sunday, Oct. 21, for Just Jazzin’ Around, an Emory Chamber Music Society of Atlanta Family Series concert designed to introduce this quintessentially American music art form to a new generation. 2. Train your lens on a photography exhibition. October is Atlanta Celebrates Photography month and Emory joins in with an exhibition at the Chace Gallery in Schwartz Center for Performing Arts starting Oct. 7. The works of 20 Atlanta photographers will be on view through Nov. 2. The exhibition is free and gallery hours are 9 a.m. to 4 p.m. Monday through Friday. 3. Attend a reading of a Jack Kerouac novella manuscript. The author lost “The Haunted Life” in the back of a cab and it resurfaced about 10 years ago at Christie’s auction house. This coming-of-age story about a college student and his conservative father will become a fully-staged version premiering next spring in Massachusetts. Kerouac artifacts from the archive will be on view. The reading will be held at the Rose Library on Tuesday, Oct. 9, at 7 p.m. and is free and open to the public. 4. Enjoy a cocktail of films of mystery and evil with a twist of dry humor. Emory Cinematheque’s series on Alfred Hitchcock’s films continues with three films, plus a bonus of three episodes from the director’s anthology television series. All showings in the series are free and they are held at 7:30 p.m. in White Hall’s Room 208, unless otherwise noted. "Strangers on a Train" (1951) screens Oct. 10; "Rear Window" (1954) on Oct. 24; and "Vertigo" (1958) on Oct. 31. The three-episode showing of "Alfred Hitchcock Presents" is Oct. 17, featuring the intriguingly-named "Revenge" (1955); "Lamb to the Slaughter" (1958); "A Crime for Mothers" (1961). 5. Examine artists’ books up close and hear two book artists talk about their art. “Bound with History: Encounters with the Rose Library’s Rare Book Collections” will feature two book artists, Ellen Knudson of Crooked Letter Press in Gainesville, Florida, and Andrew Huot of Big River Bindery in Norcross, Georgia, talking about their training, inspiration and process. Guests will be invited to touch and turn the pages of selected artists’ books, removed from under the glass display. A reception will follow the event, which will be Thursday, Oct. 11, from 4:30 p.m. to 6 p.m. “Bound with History” is related to the exhibit “Common Thread: Women’s Experience through Artists’ Books” on display at the Rose Library through Jan. 11. 6. Get some sharp insight into the current political climate. Politics is in season and you can hear Alan Abramowitz, Emory’s Alben W. Barkley Professor of Political Science, discuss his book “The Great Alignment: Race, Party Transformation, and the Rise of Donald Trump” on Tuesday, Oct. 11, at 5:30 p.m. at Barnes and Noble at Emory. A book sale and signing will follow and refreshments will be served. The public is invited to this free event. 7. Hike a different granite mountain. Pull on some sturdy hiking shoes, fill up your water bottle and join the Center for Women for a hike of Panola Mountain just east of Atlanta in Stockbridge. Panola, a restricted area, is a 100-acre granite outcrop similar to Stone Mountain but more pristine. The 3.3-mile walk on Saturday, Oct. 13, begins at 10 a.m. and is expected to take approximately three hours. Costs are $8 for the hike and $5 for parking. 8. Attend theater in the woods. Come dressed for the weather to see an outdoor play. “In Earnest” is a site-specific adaptation of Oscar Wilde’s play “The Importance of Being Earnest” by Dooley’s Players in the Department of Theater Studies. It will be performed from the back porch and in the forest outside the Math & Science Center on Saturday, Oct. 13, at noon. It will also be performed at other dates and times in October. Tickets are free but need to reserved. 9. Attend a program on Robert Lowell as poet and patient. A panel will discuss prominent American 20th century poet Robert Lowell, who suffered from manic depression. The program, entitled “Moods and Music: Robert Lowell, Poet and Patient,” will feature Kay Redfield Jamison, Dalio Professor on Mood Disorder and professor of psychiatry at The Johns Hopkins School of Medicine. It will be held Tuesday, Oct. 23, from 6:30 p.m. to 8 p.m. at Emory Brain Health Center at Executive Park. The event is in partnership with the National Network of Depression Centers and the Johns Hopkins Mood Disorders Center. The program is free but an RSVP is required. Memoirist and essayist Daniel Mendelsohn talks about “An Odyssey: A Father, a Son, and an Epic,” his deeply moving memoir of he and his father’s transformative journey reading and reliving Homer’s epic masterpiece. He weaves in family history, retracing the semester in which his 81-year-old father sat in on the freshman seminar on the “Odyssey” he taught at Bard College, and the Odyssey-themed cruise that followed. This free event, in the Laszlo Excalibur Lecture series, is Thursday, Oct. 25, at 7:30 p.m. in Ackerman Hall of the Michael C. Carlos Museum.